The VC fund raising in Indian Tech sector has reached new heights in year 2014. Between second quarter (2Q2013) of last year and first quarter of this year (1Q2014), Indian tech companies collectively raised $1.3 billion spread across 266 deals, which was over 69% more compared to previous year. In the first quarter of 2014 alone, $427 million worth of investments were made in as many as 64 deals. The second and third quarter of 2014 also saw some big VC deals – the biggest of them all being the eye-popping billion dollar fund raise by Flipkart in July. 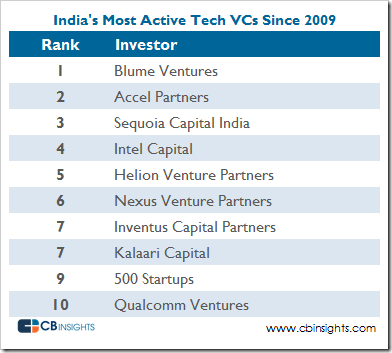 So, who are the VC’s who are pouring the funds in India’s growing tech scene. While the large funding deals (over USD 25 million) are mostly done by foreign private investors and fund houses, India based Venture Capital firms are very active in early-stage and mid-stage equity deals. 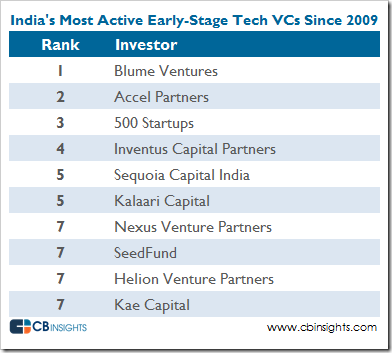 When it came to early stage Tech VC investments Blume Ventures and Accel Partners topped the list with investments in over 25 India-based companies each. 500 Startups had third highest number of investments followed by Inventus and Sequoia. Interestingly, only half of the top early-stage tech Venture capital firms are local, which shows that foreign investor interest in Indian tech companies is quite high. 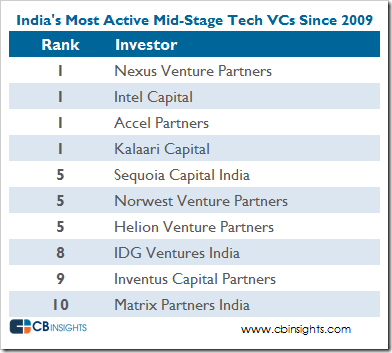 When it came to mid-stage investments Nexus Venture Partners, Intel Capital, Accel Partners and Kalaari Capital led all other investors as the most active Tech VCs in India at the mid-stage since 2009. E-Commerce was undoubtedly the leader when it came to attracting VC investments. According to CBInsights, 72% of all funding to tech companies in the previous four quarters (2Q2013 to 1Q2014) went to E-Commerce companies. Internet Software & Services and Mobile Software & Services companies were the next two sectors that attracted tech funding in India.